Lawn Dawg adds about 26,000 customers and $15 million in annual revenue to Memphis, Tenn.-based TruGreen, which did more than $1.3 billion in 2016 revenue and ranks No. 2 on the 2017 LM150 list of largest landscape companies, second only to BrightView. Majority of Lawn Dawg’s front-line employees at its 11 locations were offered jobs with TruGreen, Campanella said. Some managers and company leaders were offered jobs, and others weren’t. TruGreen also recently acquired TurfMasters, a lawn care company based in South Windsor, Conn. The Lawn Dawg deal, which only had been in the works seriously since July, provided an exit for Atlanta-based Brighton Partners, a private equity firm that had owned about 65 percent of Lawn Dawg since 2009. In spring 2016, Campanella got word that Brighton was ready to exit. At that point the firm was seven years into its investment with Lawn Dawg—beyond the typical three to five year private equity deal. “I really wanted to stay, to keep it going,” Campanella said, noting he and his partners sought multiple opportunities outside of a traditional sale. Initially, they hired a broker to find a “tier 1” private equity firm to take Lawn Dawg national. The search was unsuccessful. “We’re big for the industry, but we’re too small for private equity, and we couldn’t raise the money or interest level we needed,” Campanella said. He also tried to raise his own funds and brought a few local private equity firms to the table to find a way to continue to grow Lawn Dawg regionally. Eventually, TruGreen made an offer that was better than any other options, he said. “I feel like I let down a lot of people—employees, friends,” Campanella said, noting he’s willing to connect folks in the industry with former “high-level performers” from Lawn Dawg who are now available. Looking ahead for Campanella, he has a lot of Lawn Dawg business to wrap-up, such as selling equipment and materials TruGreen didn’t buy. 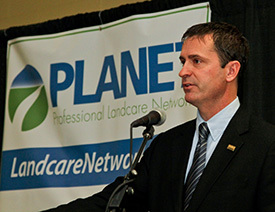 He also said he intends to serve out his volunteer board term for the National Association of Landscape Professionals. He has a five-year noncompete in the counties where Lawn Dawg operated, although pest control is excluded, so the pest management business is a consideration. He said he’s also not afraid to move.